The big wave has finally crested. The humble ukulele has had its day as the go-to instrument for musical beginners and recreational players. What triggered this monumental change? ► Prince Philip likes ukulele music, as he drives. Prince Philip, 97, had an automobile accident. A report, earlier this week, that at the time of his accident, in which he flipped his Land Rover and injured a couple of peasants, but was fortunately unhurt himself, Prince Philip had ukulele music playing on his stereo system, in the vehicle. “It’s not hard to put two and two together,” said a police source said anonymously. “Most people can’t stand the ukulele music, myself included,” said our source; “it irritates them to no end and fuels road rage. Yet, a significant minority of people find it entrancing; ukulele music lulls them into a kind of stupor. I expect that’s the defence that the Prince will mount. Either way, we’re going to have to ban ukulele music from automobiles,” which, the source concedes, could mark the end of the ukulele as a popular instrument for beginners. The ukulele was initially a breath of fresh air. It had advantages over the guitar. It was cheaper and easier to carry and tune. As well, you could go into a music store and be reasonably certain that no one was sitting around trying to play “Stairway to Heaven” on the ukulele or enter a public square without worrying that some Bob Dylan wannabe was strumming “Like a Rolling Stone” to the strains of a ukulele. ► What will replace the ukulele? If the time is up for the ukulele, what is going to take its place? The guitar, again, might claim a top spot. No, people are still tired of guitars. The mandolin: mandolin orchestras abounded during the early part of the last century. No, it will have to be something fresher. What of there was more interest in the recorder, melodica or harmonica? The problem with these instruments is that they all use the mouth, making it difficult and in some cases impossible to sing and play at the same time. I think the instrument that is the up and comer is the glockenspiel. 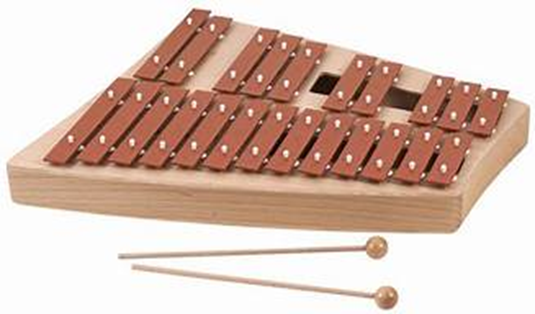 The glockenspiel has had a bum rap, earning most of its reputation as a hammering toy for a child. Serious musicians have employed it. Bruce Springsteen used it on his famous “Born to Run,” as did the Beatles on “Being for the benefit of Mr. Kite.” Radiohead and Rush have used it too. The glockenspiel is evident at many US college football games when the band strikes up between plays. In its most basic form, the glockenspiel consists of one set of eight or twelve notes, comprising a scale and a scale and a half respectively. Although that sounds limiting, the full dress glockenspiel used by a marching band can span some three and a half octaves. For me, the day can’t come soon enough when the fresh tones and hammered bells of the glockenspiel replace plunkety-plunk sound of the ukulele. I can picture the County glockenspiel band marching in the Pumpkinfest parade, even if it has to follow behind the Wellington ukulele ensemble. Louis Armstrong would only have to turn over in his grave once.